Too Much time on my hands: Earth Day Thursday- Old Fence or Amazing Headboard? 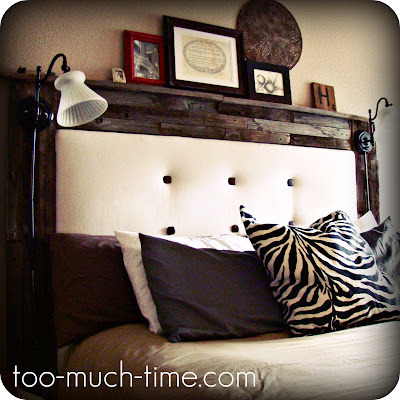 Earth Day Thursday- Old Fence or Amazing Headboard? 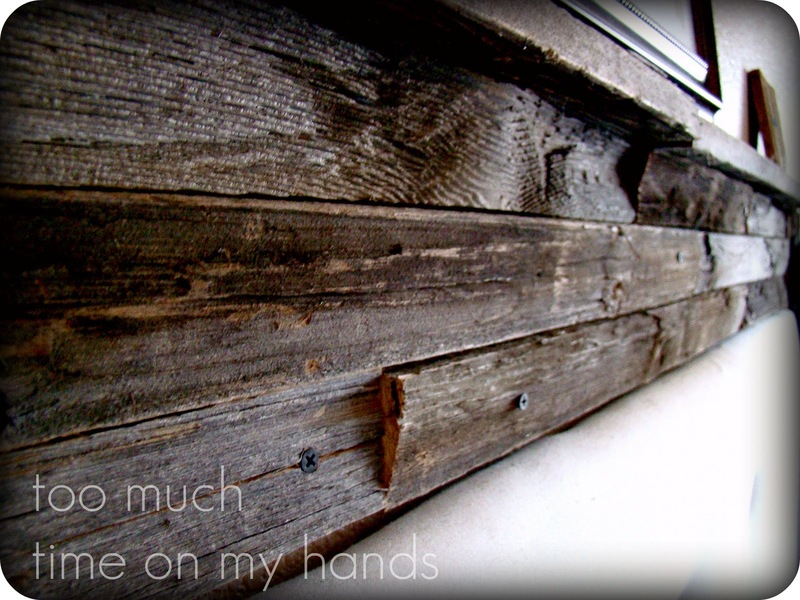 "That wood? Right there? 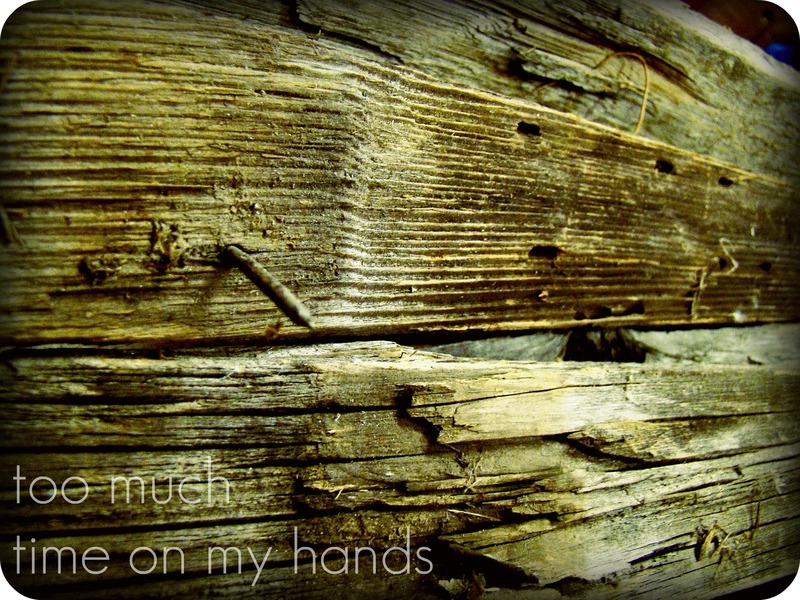 With all the splinters and rusty broken nails sticking out of it? You are going to use that for a headboard?" "I don't think that's what you want to use for a headboard." Tell me I can't do something and look at what happens! 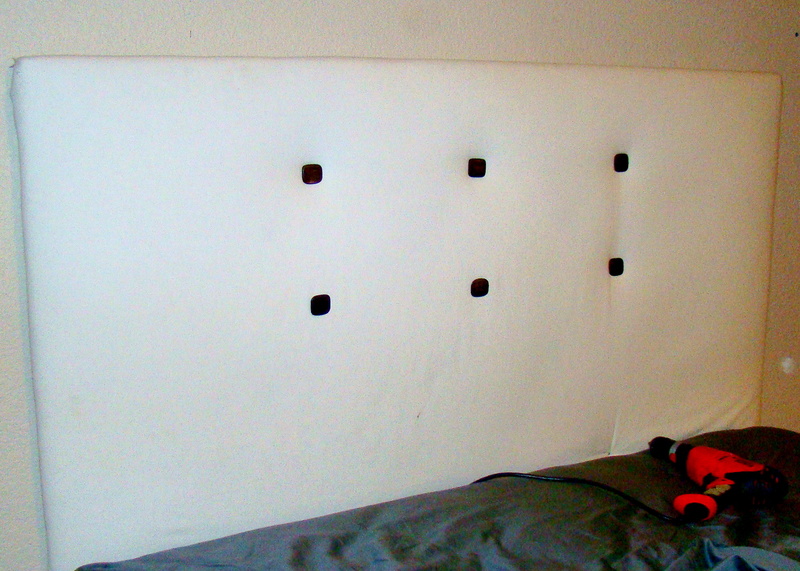 I even mounted our bedside wall lights onto that no good old wood that some crazy person gave me for free. I had this to start off. 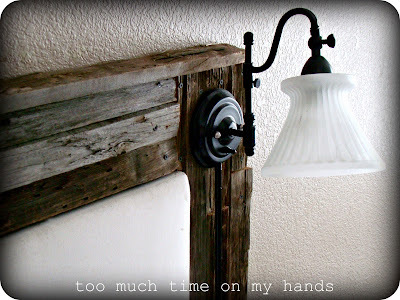 Then I saw this photo on Pinterest and it became my mission and all I thought about until I finished the project. 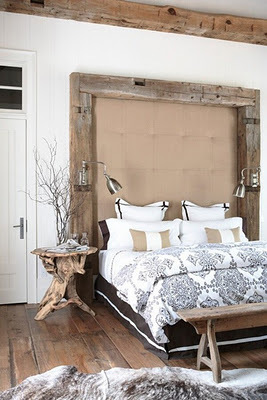 I love everything about this bed, the colors, the materials, the rustic vibe. I also like how grand it is, but I was just going to stick with my basic upholstered piece, because I honestly didn't want to spend any money and this was a total whim. 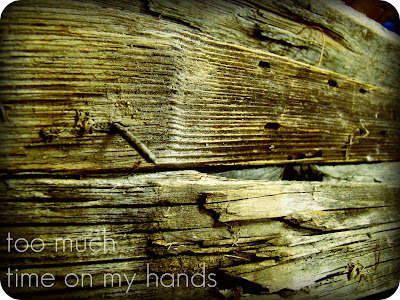 Check out all of my inspiration photos here. I ripped that shelf off of the wall and had my blank canvas. I gloved up and pulled all of those rusty, bent, and broken nails out of a bunch of boards. 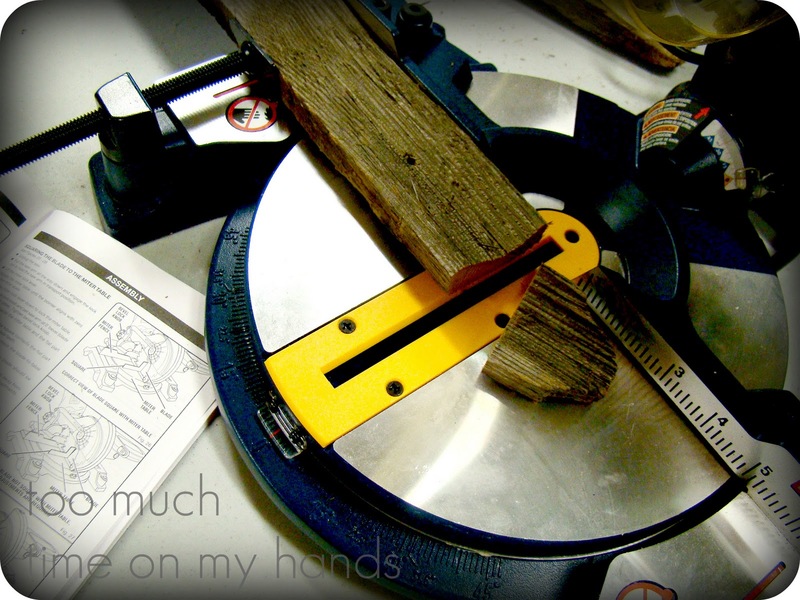 and started measuring and cutting. Meet Mr. Handsome...my new miter saw. I swear-start to finish it was fabulous and easy. 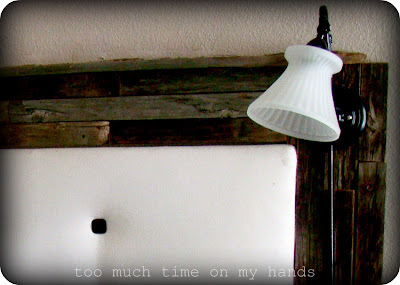 I cut the boards in the garage and hauled them up to my bedroom. I just drilled 'em in and since the boards were so old and worn out the screws went in super easy. I was careful to be sure that the edges were all varied so it looked haphazard and not all lined up. I even threw a little ledge up there because it all went up so quickly and I had energy and boards left over. I keep looking for reasons to go upstairs and walk by my room! Those lamps are from Home Depot about 2 years ago and they used to be silver. Love it! I like your spontaneity, and well done proving that naysayer wrong. Gorgeous job...I really like how you hung the lamps too, it all just looks really well done. Gorgeous! I can't believe you did it so quickly! Amazing! Love, love, love it! It looks fabulous! I'm so glad that you proved him wrong. And how does he like it??? My vote? 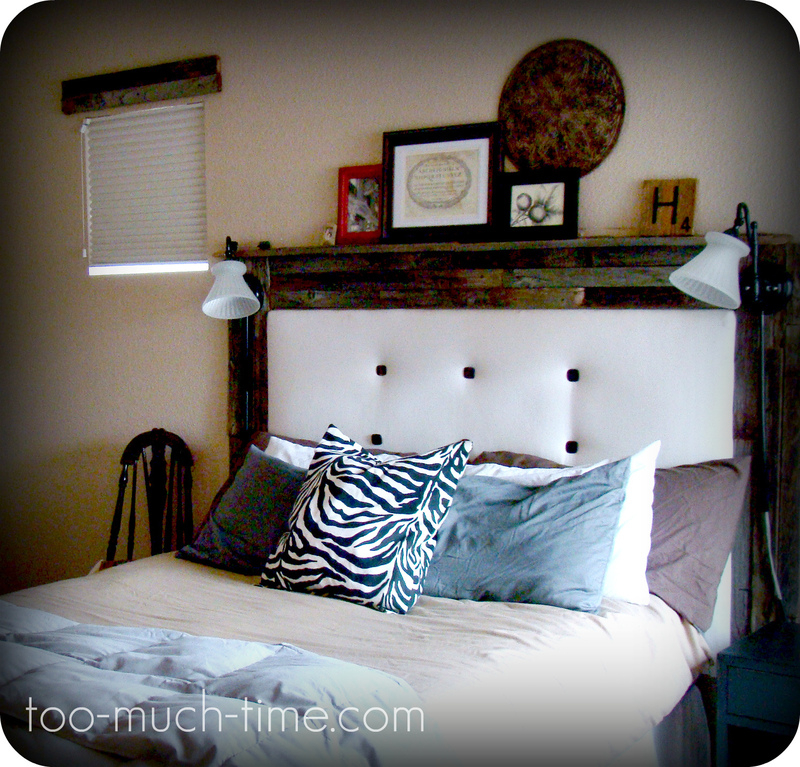 Amazing Headboard!!! :) Post this everywhere! You are about to get a TON of features for this one! Super Super Awesome! I think I will Pin it too! That is AmAzInG!!!! Good job, Girl. Virtual pat-on-the-back-high-five-hug! LOVE it! It's just fabulous, like in a "I can't believe how creative, imaginative, and brave some people are" kind of way! Great job! I like it even more than ANY of your inspirations! It's really great! Bravo! We are getting a new king size delivered on Monday.. I opted to make my headboard instead of buying one.. great inspiration! Seriously Incredible!!! I would have never thought about putting wood around it, but it looks awesome! Way to pull off the rustic glam look! It looks amazing! I need to muster the courage to tackle bigger things like this. It looks gorgeous! You go girl! I feel the same way when someone tells me I can't. Motivated me to do it! Looks great! This is an awesome transformation!!! Wow! I love it! Oh my goodness, I love this! 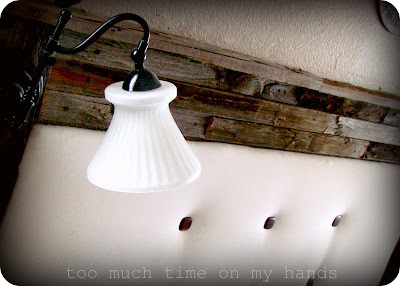 I have so many headboard ideas, I need a couple of bedrooms.... For myself. :) Awesome job! I'm dying over this. SO AWESOME! I need to figure out where I can put one in my house. I can understand why you keep finding reasons to go past your room - it looks beautiful! I love it! You go girl I LOVE it! You go with that power saw! It looks fabulous!! Wow! I LOVE this! It looks fabulous!! I like your headboard much better now! GREAT job!! That's gorgeous! Way to go! So I saw the picture of your saw and thought - "this is a fake picture, I've never seen a saw that clean!" Then I read the caption. Good job! Enjoy your saw - mine is one of my prized possessions! It looks fantastic! 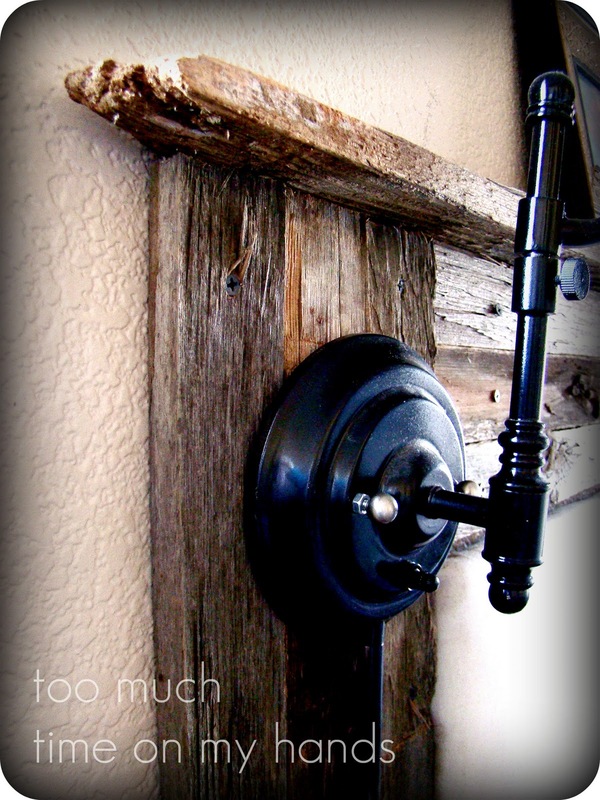 The sconces are the right touch! Would you be able to link up to my Friday party? I would love if you would! It's so well done! What an amazing job you did. 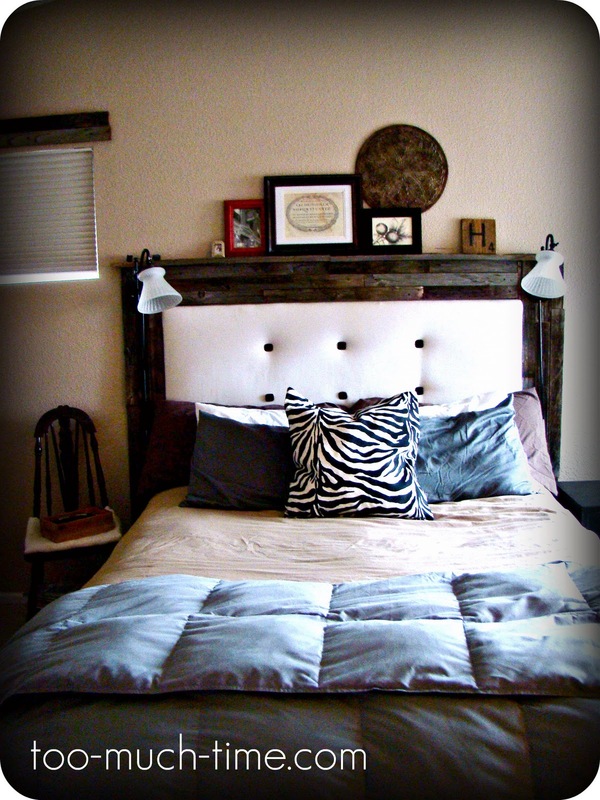 Love the rustic warmth of this bed! I am kind of in love with what you did. It looks amazing - picture perfect! 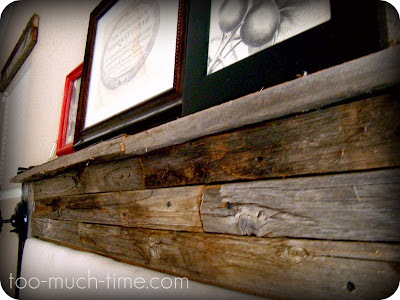 It looks fantastic and perfectly rustic! 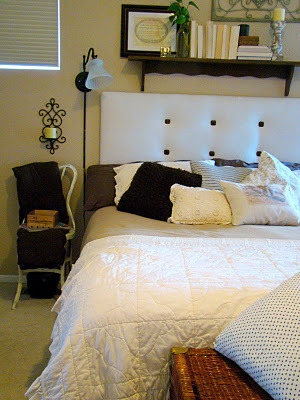 I love the mix with the refined white headboard. We are in the process of making a headboard for our basement guest room makeover, using planks that were laying in a pile leftover from my fil's old sawmill. You are so smart! I love it when you see something that you know will look great and then are able to do it. The icing on the cake was being told that it won't work and you shouldn't do it. Did you take a picture, show this person and say "NA, NA, NA, NA, NA"? I love your version MUCH better than the inspiration piece! Good for you for proving that you can do it and do it better!! It looks gorgeous! You are a genius! Your version is MUCH better!